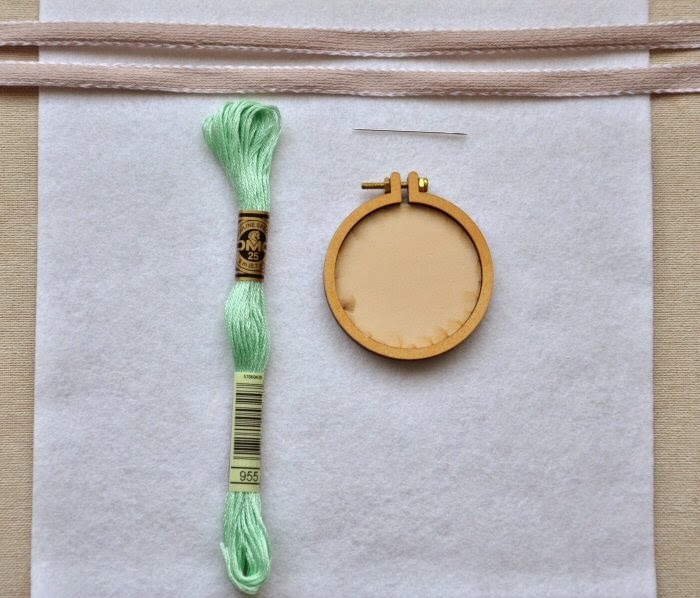 Today we are excited to present a tutorial in collaboration with Cloud Craft, a UK-based shop that sells all kinds of delicious embroidery goodies! Christine stitched up these three sweet AND quick projects using supplies from Cloud Craft - and at the bottom of today's post, we have a giveaway for those very same supplies! Fab, right? Thank you, Cloud Craft! 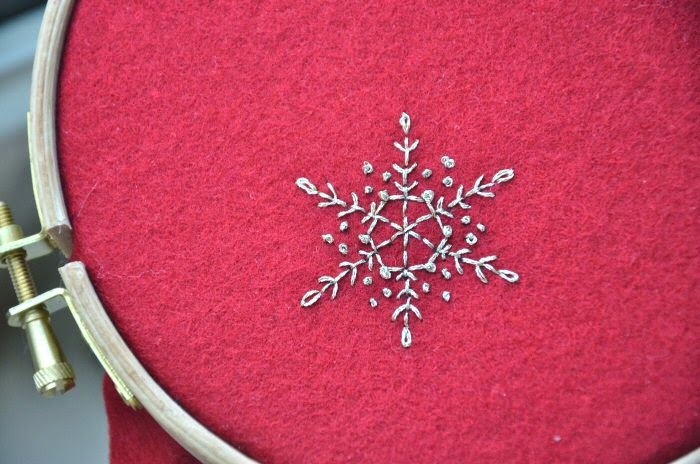 The clock is ticking...Christmas is looming large now...so for you time-strapped people who have a long list of gifts to give, here is a simple, speedy, yet festive and pretty snowflake design to embroider. Not your average, straight-stitched ice crystal, this dainty snowflake features lazy daisy stitches, French knots and fly stitches – plus a hexagon centre for all you hexie-loving stitchers! This motif can be used on clothing, quilts, cushions...but keeping with the last-minute strand, we have three quick makes. 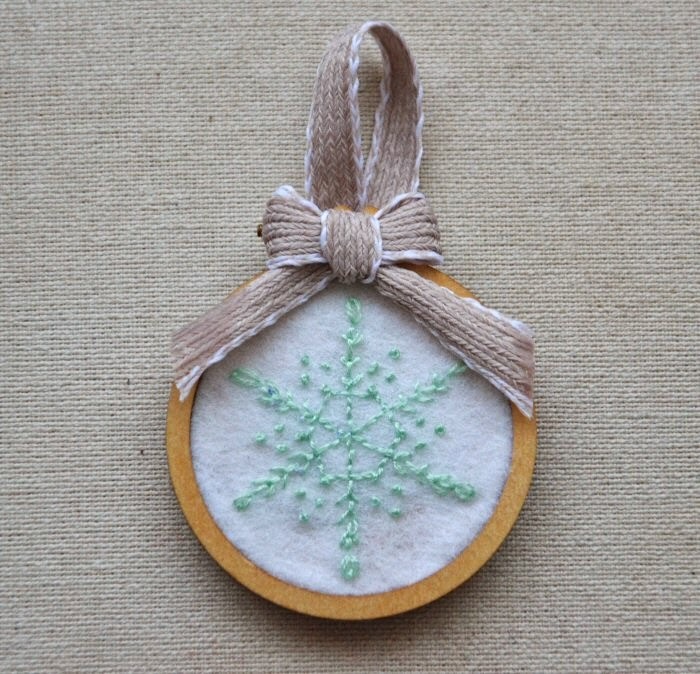 Download the pattern for the snowflake here - also includes a bauble template. 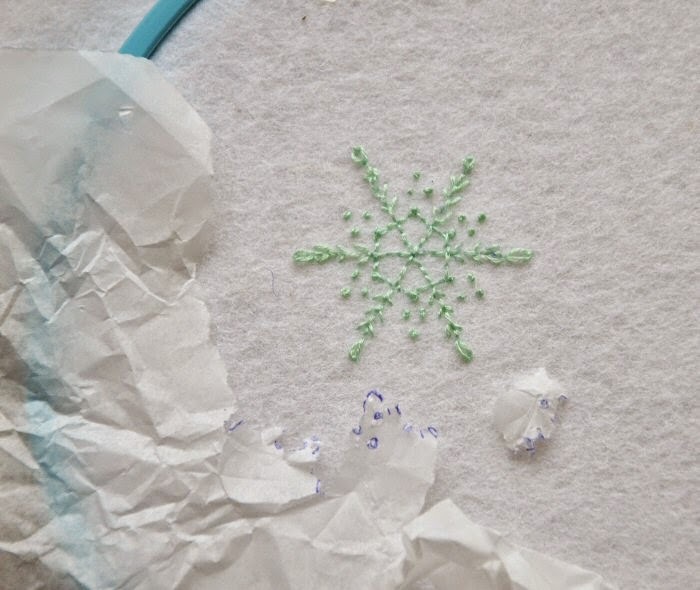 An ornament, with the snowflake stitched in a trendy aqua shade and framed in a tiny embroidery hoop. 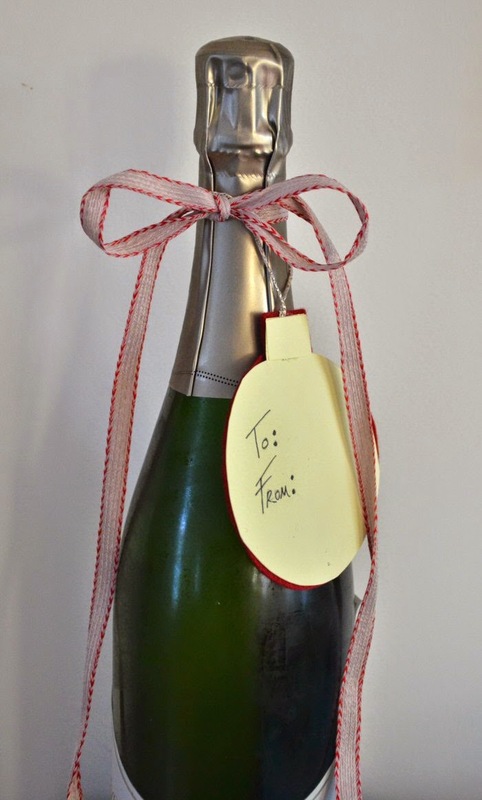 A gift tag, with the design in a decadent gold on rich Christmas red – the perfect way to jazz up a bottle of wine or box of chocolates. 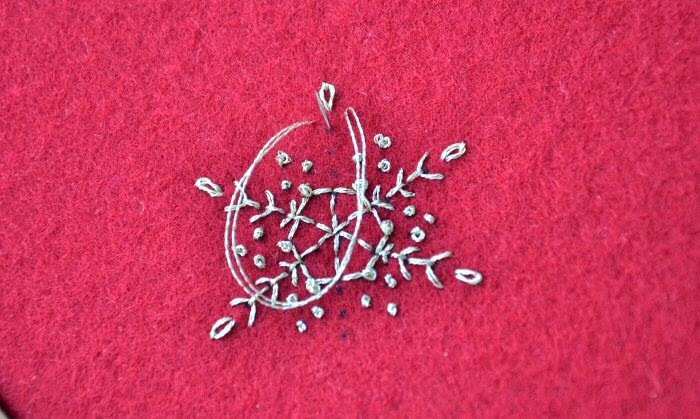 And a snowflake brooch, in a regal jewel tone, perfect for your winter coat. Each creation is made using small amounts of felt and floss and makes a sweet keepsake. Felt is wonderful for stitching because it doesn’t fray and the needle slides through the fabric with ease. However, it is very challenging to transfer an image accurately to felt. Drawing on the surface, whether it be pencil, pen, even chalk, can result in a matted mess of tiny fibres. Often your best bet is to trace the design onto tissue paper, pin the paper to the felt, and stitch through both layers. Then gently tear away the tissue from the stitches when finished. 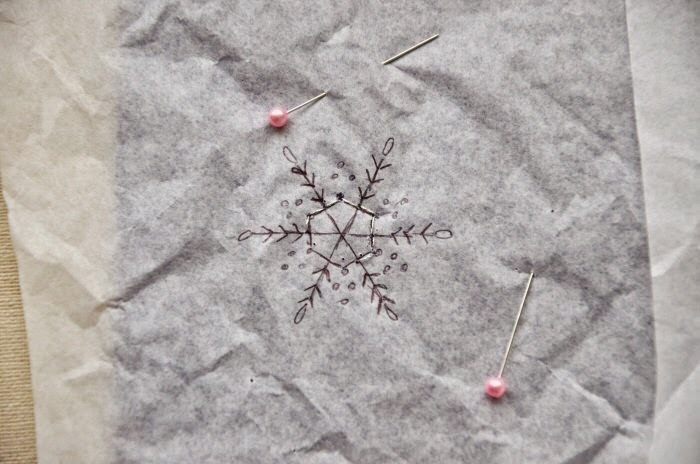 But I found this method annoying with my tiny snowflake design. I couldn't seem to stitch a straight line on the hexagon. I like to see my fabric, not a crinkly tissue layer. My solution? I played connect the dots. 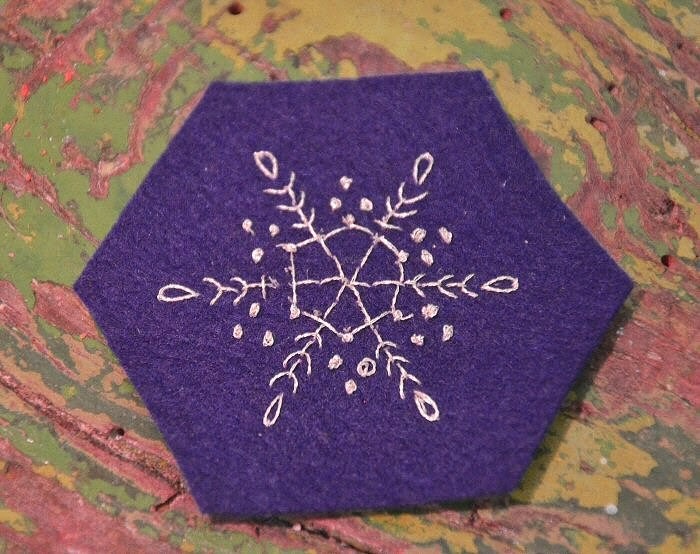 With a fine-tipped Sharpie pen, I poked tiny dots through the tissue onto the felt, at the hexagon points, the base of each fly stitch, the French knot groups. 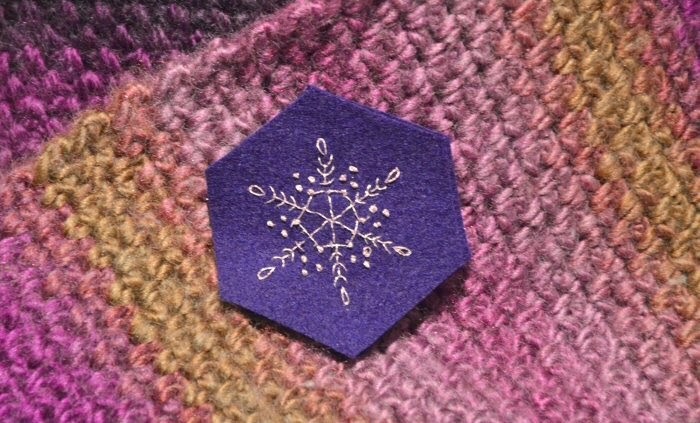 This technique works well with angular designs like the snowflake, because it is easy to deduce the direction of the stitches and which dots to connect. 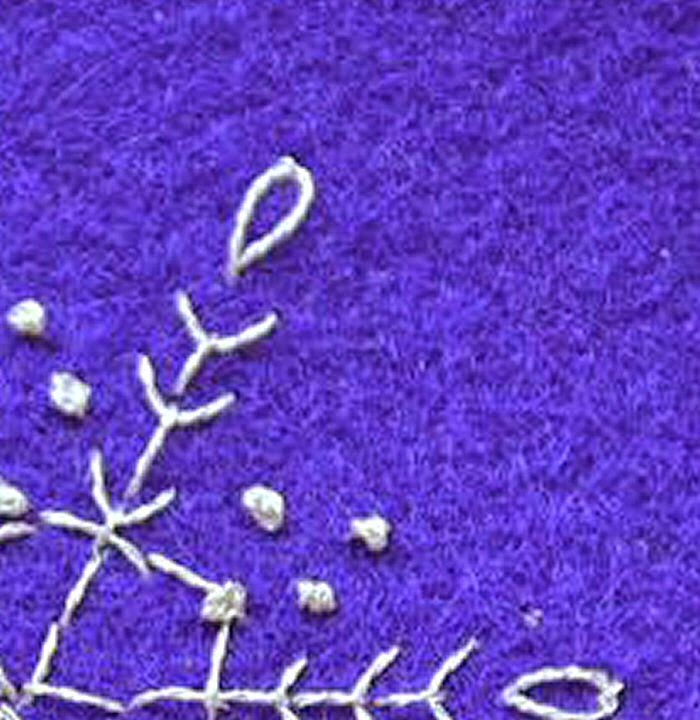 Metallic thread is oh-so-festive, but it is notorious for being fiddly. Undaunted, and with Thread Heaven floss conditioner at my side, I stitched snowflakes with one and two strands of metallic floss. I found it easy to stitch through the felt, probably because of the ease of the fabric. 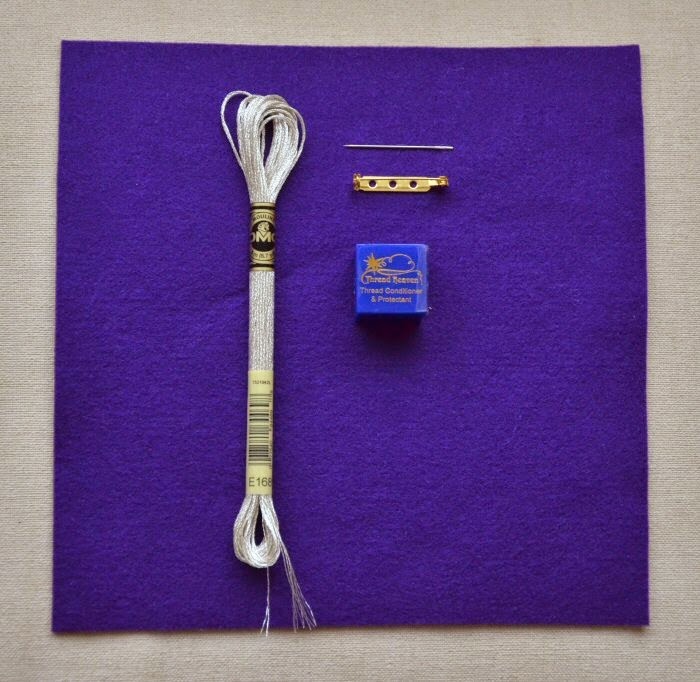 The gold threads behaved better and I was able to use two on the red felt. 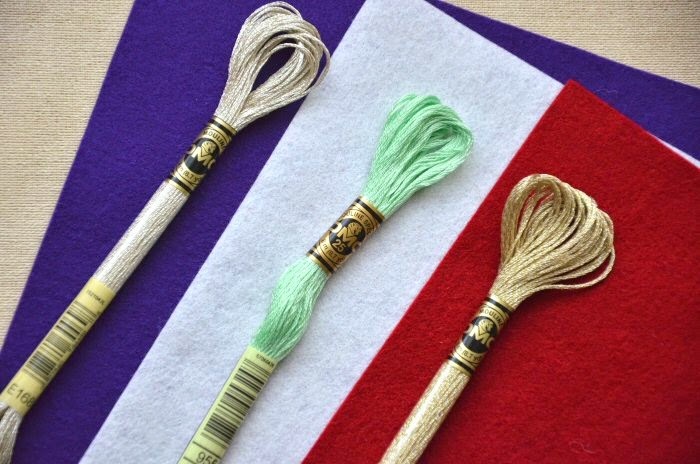 Whatever floss you choose, once you've stitched the design onto felt, it can be transformed into an ornament by popping it into a tiny hoop frame. Here I used the Dandelyne hoop frame and added a small bow made from a natural-coloured ribbon. 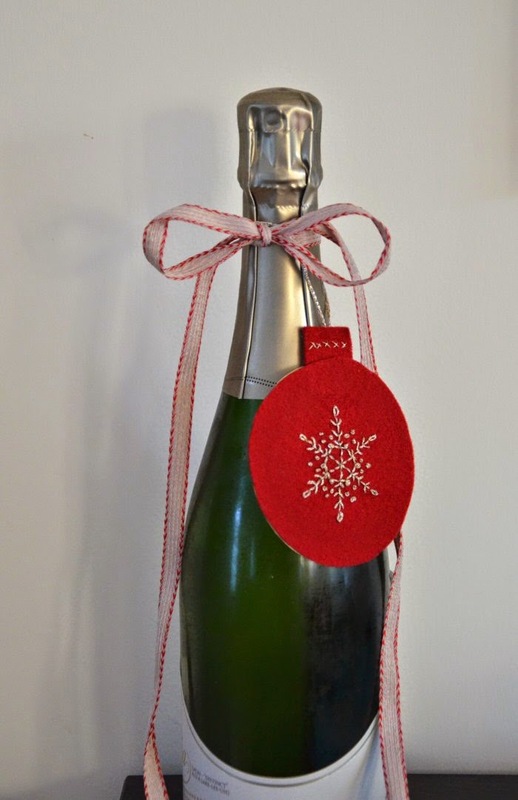 Gift tags can be made in any shape or size – for a bauble shape, I used a round cookie cutter to trace around the snowflake, then made a duplicate out of card, and glued it to the back of the felt. Easy! The brooch is made simply by attaching a brooch back onto the felt - I cut out the shape and secured two pieces of felt together, then added the pin. I kept the design very simple because I wanted the sparkly snowflake to be the focus, but you could easily add decorative stitching around the edge, a contrasting colour of felt for the back, etc. Giveaway - materials to make the projects in this post. Felt, floss and Dandelyne mini hoop from Cloud Craft. Entries to this giveaway are now closed! - you cannot get extra entries by tweeting, liking on Facebook, etc etc. One person, one entry. 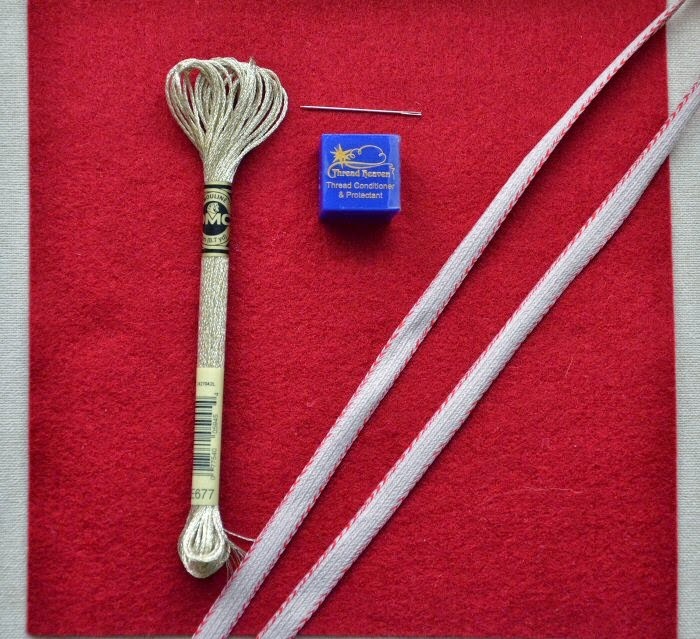 - we'd love to hear about what other easy projects you could make with the classic felt + floss combo but that is optional! There must be a way to contact you, so make sure to either leave an email address, a link to your blog or somewhere else where an email can be found. We will not notify the winner by leaving a comment on your blog. You can also leave your Flickr name or Twitter @. Entries by 'Anonymous' cannot be accepted, we must have at least your first name - and a way to contact you as mentioned above. The giveaway closes Friday, December 12, at 1pm UK time, and the winner will be notified by email. Gorgeous! I've never used metallic thread! I love the snowflakes! So pretty! I am not entering to win but did want to say Thank You for sharing. I have all the supplies already to make these so please someone else if my name should be pulled. These are so sweet. The stitches you used are fun ones also, nothing like space covering fly stitch and lazy daisy. Thank you so much for the chance. It is a great idea of Christmas gifts. Your designs are looking very good and attractive. I am very fond of stitching and this way I can show my experience to others with the gifts. 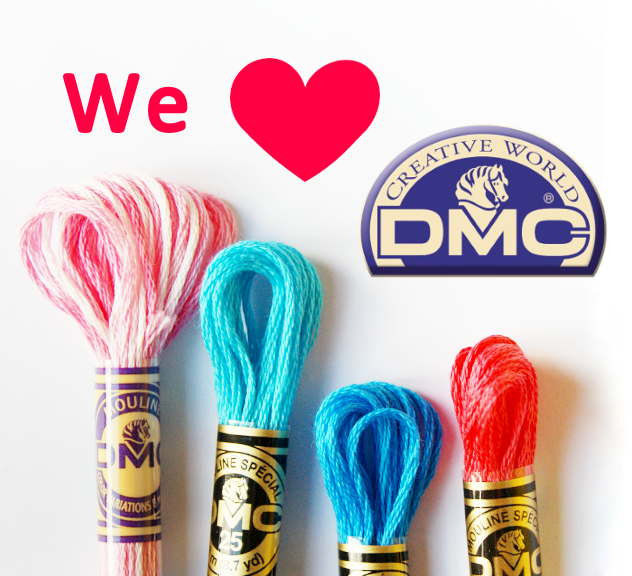 I have taken the monthly subscriptions for different clubs such as Silver Thread Golden Needles Club and the Premium Embroidery Club. 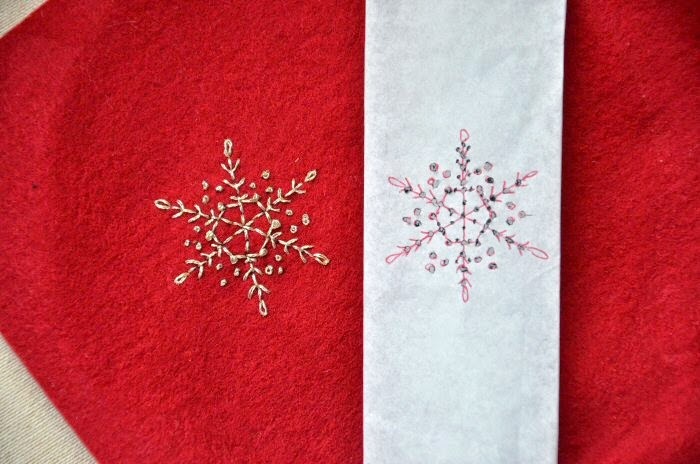 Lovely little snowflake projects! I could see using this pattern with felt and floss for coasters or stitchy bookmarks, too.